Don’t be daunted by the running time: This character study from Turkish master Nuri Bilge Ceylan is a richly engrossing experience. 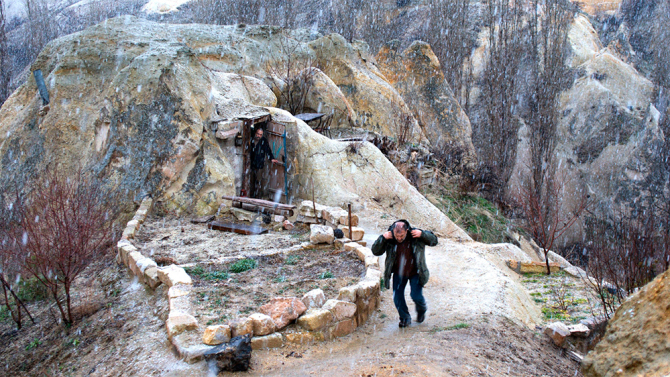 Nuri Bilge Ceylan is at the peak of his powers with “Winter Sleep,” a richly engrossing and ravishingly beautiful magnum opus that surely qualifies as the least boring 196-minute movie ever made. Following Ceylan’s sublime 2011 drama “Once Upon a Time in Anatolia,” this equally assured but considerably more accessible character study tunnels into the everyday existence of a middle-aged former actor turned comfortably situated hotel owner — and emerges with a multifaceted study of human frailty whose moral implications resonate far beyond its remote Turkish setting. Simultaneously vast and intimate, sprawling and incisive, and talky in the best possible sense, the film will be confined to the ultra-discerning end of the arthouse market thanks to its daunting running time and deceptively snoozy title, but abundant rewards lie in wait for those who seek it out at festivals and beyond. Deep in the central Anatolian region of Cappadocia, a poor boy, Ilyas (Emirhan Doruktutan), throws a rock at a moving truck and shatters the front passenger window, startling the two men in the vehicle as well as the audience. Not long afterward, Ilyas’ surly drunk of a father, Ismail (Nejat Isler), nearly comes to physical blows with the driver (Ayberk Pekcan), while the other man, Aydin (Haluk Bilginer), hangs back at a timid distance. It may not be immediately clear, given how the scene plays out, but this is, in fact, Aydin’s story, and what we’ve just seen is a minor example of his complacency and casual indifference to the suffering around him. Something of a small-town celebrity due to his earlier acting career and the regular columns he now writes for the local newspaper (Voices of the Steppe), the grizzled, gray-haired Aydin leads a more idyllic life than most. Educated and wealthy, with an abundance of knowledge about Turkish theater that he hopes to turn into a book someday, he runs a small hotel with his much younger wife, Nihal (Melisa Sozen). He is also Ismail’s landlord, and has recently had to send around a debt collector — a humiliation not lost on Ismail’s brother Hamdi (Serhat Kilic), an eager-to-please imam who brings young Ilyas around in an attempt to make amends for the (now-explained) glass-breaking incident. But while the film will eventually return to that matter before the coda, what’s remarkable is the manner in which the script (written by Ceylan and his wife, Ebru) steers away from run-of-the-mill plot mechanics in favor of a more revealing and no less absorbing immersion in the conversations — long, glorious, generously overflowing, superbly sculpted and acted conversations — among Aydin and his friends and family. Some of these run for several minutes on end, as when Aydin gets into an extended argument with his recently divorced sister, Necla (Demet Akbag), which steadily devolves into viciously personal character attacks that are clearly not being lobbed for the first time. Individual character, in fact, is what interests Ceylan most here, and without registering as overly didactic, the moral positions debated in “Winter Sleep” cannot help but rouse similar questions among attentive viewers — about the decisions we make, the images we present to the world, and the degree of grace and empathy we choose to extend to those in need. As soon becomes clear from his sister’s bitter tirade, Aydin is a man whose selfish pride and complacency have largely deadened him to matters of faith and feeling, and who has effectively buried his emotions beneath a carapace of intellectual superiority and practiced cynicism. “I wish my threshold of self-deception was as low as yours,” Necla tells him witheringly. Still, it’s Nihal who really draws blood when she gets the chance, spurred by a disagreement with Aydin over a charity project she’s undertaken to improve conditions at local schools. Ceylan has captured relationships coming apart at the seams before, notably in 2006’s “Climates,” and the long marital-spat sequence he stages here is a revelation. So is Sozen, who simply mesmerizes in her role as Nihal; within a matter of minutes, the actress lays bare the essence of a beautiful, intelligent, passionate young woman who gave up nearly everything she cared about in order to take a husband many decades her senior, and who resents his interference with one of the few opportunities for personal fulfillment she still has available to her. Nihal has since come to the irrevocable conclusion that Aydin is, for all his many indisputably fine qualities, “an unbearable man” — arrogant, judgmental, stingy and ultimately misanthropic at heart — and it’s a measure of the integrity of Bilginer’s performance that he does full justice to the charge. Whether he’s strategically deflecting his wife’s criticisms or responding with a patronizing chuckle, he never seems to be making an overt bid for audience sympathy at the expense of emotional truth, and yet he never sacrifices the underlying charm that has no doubt been crucial to his success. A well-known face in Turkish cinema who has racked up several English-language credits over the past few decades (including “Ishtar” and the British soap “EastEnders”), Bilginer brings Aydin fully to life onscreen, making him eminently rewarding company even at his most indefensible. Uneventful as all this may sound on paper, it will prove entirely involving onscreen for viewers who love the increasingly rare spectacle of vibrantly conceived, fully fleshed-out human characters delving into the emotional muck and mire of their relationships. Aydin and Nihal may be speaking in rapid-fire Turkish, but viewers of any background will pick up on the seething language of emotional warfare, the relentless verbal thrusts and parries, and may well find themselves cringing in recognition. The film’s tone does shift and broaden unexpectedly in its third and final hour, as Aydin decides, for the sake of his marriage, to retire to Istanbul for the winter. The consequences of the decisions he and his wife make during their time apart are alternately humorous and wrenching, building to an emotional climax that seems to rebuke the characters for their naivete even as it enfolds them in a tender final embrace. Particularly crucial here are the exceptional performances of Isler and Kilic as two very different brothers who, thanks to their everyday struggles with failure and poverty, cannot even afford the luxury of Aydin and Nihal’s bickering self-reflections. It comes as no surprise that the director’s regular cinematographer, Gokhan Tiryaki, has produced another treasure trove of exquisite widescreen images, taking particular advantage of the Cappadocian landscape as it’s being pelted with snow. And yet, for all the region’s visual wonders — eerie cave formations, buildings cut directly into rock, wild horses galloping freely about — the supreme visual achievement of “Winter Sleep” may well be the beauty it finds in the crags and contours of its actors’ marvelously expressive faces, sustained and magnified at every turn by Ceylan and Bora Goksingol’s crisp, seamless editing. The film’s long midsection will likely have at least a few viewers thinking back to “Scenes From a Marriage,” and indeed, there is something of Bergman’s artistry in the heightened intensity and sensitivity with which Ceylan scrutinizes his characters, though transfixed by their every expression and word. Musically, the director borrows a page from still another European master: The only accompaniment we hear is a recurring non-diegetic snippet from Schubert’s Piano Sonata No. 20 — a direct allusion to Bresson’s “Au hasard Balthazar,” one of the greatest spiritual laments for the human condition ever committed to film. Ceylan’s bracingly humanist vision may not be quite up to that exalted standard, but a tip of the hat feels more than fully earned.